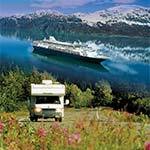 Comprehensive links to attractions, bed & breakfasts, hotels & motels, outdoor adventures, sightseeing tours and more for the Yukon Territory, Inuvik, Beaufort Delta, Northern British Columbia and Skagway Alaska. The solitude, the scenery, the sights – take in our wide open spaces and enjoy the Yukon’s stress-free, relaxed atmosphere. The Yukon is located in northwestern Canada, next to Alaska. Drive the Alaska Highway from British Columbia, take a ferry up the BC/Alaska Inside Passage, or fly direct on daily jet service to Whitehorse. Scheduled flights depart Vancouver, Calgary & Edmonton, as well as Alaska, the Northwest Territories, Ottawa (via Yellowknife) and Frankfurt, Germany. Flying to the Yukon is as easy as any other major travel destination. Once in the Yukon you can camp under the midnight sun. Fish at a four-star lodge. Float the Yukon River. Mush a dog team. Enjoy world class musicians and artisans. Relax on the deck of a secluded log cabin. Catch the gambling nightlife in Dawson City. Take home a “made in the Yukon” treasure. Whatever your Yukon dream, our site will provide you with the information, tips and ideas that will help make it a reality. The Yukon has a total area of 483,450 square kilometres, including 4,480 square kilometres of freshwater area. The majority of the land is forested––281,030 square kilometres. Eighty percent of the Yukon is wilderness, compared to a North and Central American average of 41 percent. The territory encompasses about 4.8 percent of Canada’s total land area. The Yukon became a separate territory within the Dominion of Canada on June 13, 1898. Yukon Holidays: Heritage Day – February 23rd, 2018 & Discovery Day – August 20th, 2018. The floral emblem of the Yukon is the Fireweed. The official bird is the Raven. The official tree of the Yukon is the sub-alpine fir. The Yukon Territory is large enough to hold the states of California, Arizona, Delaware and West Virginia. The famous Yukon River is 1,979 miles (3,185 km) long. You can canoe from Whitehorse to the Bering Strait. The central part of Yukon receives 6.5 inches (165 mm) of rain per year, less than Arizona. There are approximately 65,000 moose, 10,000 black bear and 4,500 wolves in the Yukon. The White Pass & Yukon Route is 110.7 miles (178 km) long. Of this, 20.4 miles (32.8 km) are in Alaska; 32.2 miles (51.8 km) in British Columbia, and 58.1 miles (93.5 km) in the Yukon. Whitehorse is the third largest city in Canada by area. The Carcross Desert is the world’s smallest at 642 acres (260 hectares). Yukon has a population of 36,794 people, as compared to that of 1901 when a census put the population at 27,219. Of our population base, over 27,000 reside in Whitehorse. This is the home to fourteen First Nations, speaking eight different languages. Gwich’in, Han, Upper Tanana, Northern Tutchone, Southern Tutchone, Tlingit, Tagish and Kaska. Yukon First Nations’ rich culture and history in Yukon dates back as far as the last Ice Age (approx. 50,000 years). The Dempster is the only public highway in North America to cross the Arctic Circle. The steamer ‘Seattle’ returned from Dawson City in November 1897 with $800,000 in drafts and securities and 35 lbs. of gold. In 1898 about 25,000 gold-seekers hiked the Chilkoot Trail for the boomtown of Dawson City. A gold nugget was unearthed in the Klondike that weighed over 72 ounces. Its value in 1898 was $1,158 – value today is well over $75,000. One of the first women crossing the Chilkoot Trail in 1897 was Belinda Mulroney from Scranton, PA. The 1,520 mile (2,446 km) Alaska Highway was constructed in eight months and twelve days in 1942. Up to 200 people died shooting the Miles Canyon and Whitehorse rapids. The rapids were named because the spray resembled the manes of a herd of white horses. The rapids are now dammed, but the City of Whitehorse retains the name. The oldest archaeological site in North America is found in a set of small caves overlooking the Bluefish River, near Old Crow in the northern Yukon. Tools dating to between approximately 10,000 and 13,000 years ago have been unearthed in the caves. Also discovered were tiny flakes of flint, the by-products of stone-tool manufacture, dated to between 15,000 and 20,000 years ago. The Bluefish Caves were obviously used by generations of early First Nations peoples, for more than 10,000 animal bones, including those of woolly mammoths, have been found here. The northern parallel of latitude at 66° 33’ north forms a boundary known as the Arctic Circle. South of this line of latitude the sun rises and sets daily. North of the line, the sun remains above the horizon at midnight at midsummer and never rises during midwinter. The highest temperature recorded in the Yukon is 36.1° Celsius, recorded on June 14, 1969 at Mayo. The lowest temperature is -63.0° Celsius, recorded February 3, 1947 at Snag. The greatest annual snowfall, of 452 centimetres, was recorded at Tuchitua in the winter of 1971-72. The wettest period ever recorded was at Watson Lake, where it rained, drizzled, or snowed for 186 days in 1966. Mayo is situated at the 53-kilometre point of the Silver Trail highway, which extends through what was once one of the richest silver mining regions in Canada. The first mining undertaken here, however, was for gold, discovered at the mouth of the Mayo River in 1902. Silver was discovered at Keno in 1919 and then at Elsa in 1929. Haines Junction stands at the crossroads of the Haines and Alaska highways. It is also the headquarters for Kluane National Park Reserve and provides an access point to Tatshenshini-Alsek Wilderness Provincial Park in British Columbia. Overlooking the community are the towering peaks of the St. Elias Mountains. Herschel Island Territorial Park In July 1987, the 100-square-kilometre expanse of Herschel Island became the Yukon’s first territorial park, created out of the settlement of Inuvialuit land claims. The park is maintained by the Yukon government in cooperation with First Nations peoples of the region. The community of Carmacks is named after George Washington Carmack, one of the co-discoverers of the gold that sparked the Klondike Gold Rush, Carmacks is located on the shore of the Yukon River 175 kilometres north on the Klondike Highway from Whitehorse. Woolly Mammoths once roamed throughout the Yukon before becoming extinct about 11,000 years ago. The mammoths grew to approximately three metres high at the shoulder, or about the size of today’s Asian elephants. They also had a similar dental structure, with massive cheek teeth. 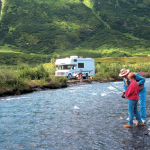 If you have ever wanted to experience the wilderness of Alaska without the restrictions of a scheduled tour, an RV trip might be perfect for you. Alaska has spectacular sights along its highways, including endless mountains, colourful glaciers and fresh or salt waterways. Explore at your own pace, spend time doing the things you want to do and don’t worry about time restrictions, you make your own schedule.